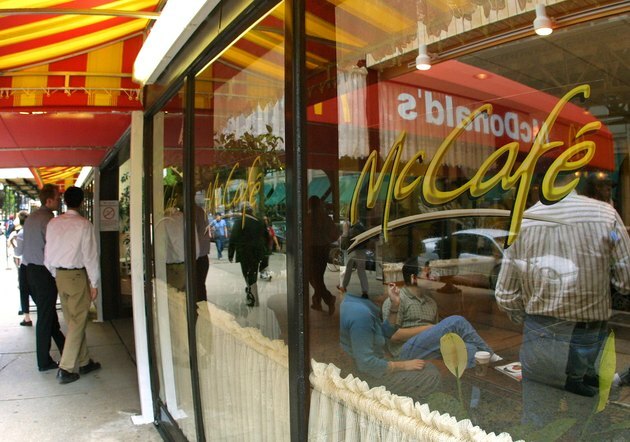 McDonald’s McCafe line offers many coffee-based drinks, including cappuccinos, mochas and iced lattes. The addition of sugar-free syrups to its menu allows you to enjoy more diet-friendly beverages, such as its Sugar Free Vanilla Iced Latte, without sacrificing taste. McDonald’s Sugar Free Vanilla Iced Latte comes in three sizes. The small 12 oz. latte has 80 calories, the medium 16 oz. latte has 90 calories and the large 22 oz .latte has 110 calories. Most of the lattes’ calories stem from the sugar in the milk. Each iced latte contains 3 to 6 g total fat, 10 to 15 mg cholesterol, 4 to 8 g sugar and 3 to 6 g protein, depending on the size. The lattes are a good source of calcium, iron and vitamin A. The Sugar Free Iced Vanilla Latte is already a better choice over most of the drinks on McDonald’s McCafe menu, but you can cut the fat completely and further reduce the calories by choosing nonfat milk over whole milk, which would allow you to enjoy it on a more regular basis. Unfortunately, McDonald’s does not offer milk alternatives, such as soy milk, for their coffee drinks, so if you are lactose intolerant, these lattes may not be suitable for you.